Commercial producers of white button mushrooms utilise a casing material to cover the spawn run compost, which stimulates the mushrooms' reproductive stage. Certain bacteria in this casing are responsible for this stimulation, which is known as pinning. Bacterial species richness and diversity within peat and peat-based casing mixtures made from industrial waste materials (i.e. 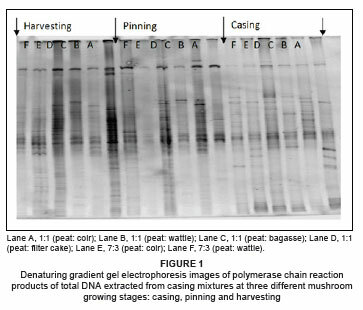 those containing coir, wattle bark, bagasse and filter cake) were examined using denaturing gradient gel electrophoresis (DGGE) at three phases of mushroom growth: (1) casing, (2) pinning and (3) harvesting. Results from the DGGE established that higher bacterial species richness occurred at pinning and harvesting than at casing. Increases in bacterial population density at pinning were greater in the peat-based mixtures, which contained industrial waste materials, than in peat alone. Peat mixtures containing these alternative materials are therefore favourable substrates for bacterial growth. The DGGE profiles for pasteurised casing materials reflected their ability to rapidly re-establish the original bacterial community. The bacteria found to be dominant in casing materials during pinning were closely related to Pseudomonas, Flavobacterium, alpha-Proteobacterium, beta-Proteobacterium, gamma-Proteobacterium, delta-Proteobacterium and uncultured species. Several researchers have reported the association of some pseudomonads with fruit body formation in A. bisporus. For example, Umar and Van Griensven4 reported that the onset of primordia occurred in casing soil which was naturally inhabited by Pseudomonas-like bacteria.4 In another study, fluorescent Pseudomonas spp., including Pseudomonasputida, were isolated from casing materials that resulted in primordial formation.5 Bacterial populations isolated from non-sterile casing were identified as close relatives of P. putida by Hayes et al.6, who also found that they stimulated fruit body formation when used to inoculate pure cultures of A. bisporus. Miller et al.7 also reported an increased proportion of fluorescent pseudomonads during the reproductive phase of A. bisporus and observed that these bacteria adhered rapidly and firmly to the walls of the mycelium. Peat is mined from wetlands, which also are sources of pure water and ecologically important niches that support plant, bird and insect life.11,12 The natural formation of peat is very slow, ranging between 0.02 cm and 10 cm per year depending on the environment10 and consequently, continuous mining of peat results in depletion of this valuable natural resource, creating ecological imbalances. The search for easily available alternative materials to replace or supplement peat in commercial mushroom production has become important in countries where this natural resource is scarce. The evaluation of possible alternatives for peat require that certain physiological, chemical (unpublished data) and microbiological criteria be met. Certain beneficial bacteria associated with the pinning stage could be used as an indicator for potentially suitable alternative casing materials, which should either be naturally inhabited by these beneficial bacteria or have the ability to support their growth once introduced. It is speculated that only 20% of naturally occurring bacteria are culturable,13 mainly because selective growth media do not provide optimum growth conditions for micro-organisms harvested from their natural environments. Microbial profiles of various environmental samples would reflect a bias towards culturable organisms if growth media alone were used. Fingerprinting molecular techniques such as denaturing gradient gel electrophoresis (DGGE) provide more accurate and detailed results than cultural techniques. Therefore, in this study, the richness and diversity of bacteria in different casing materials were examined using a polymerase chain reaction (PCR)-based method. The materials used to prepare the mushroom casings were South African reed-sedge peat, and the industrial waste materials coir, wattle bark, bagasse and filter cake. Peat originally obtained from Potchefstroom (North West Province, South Africa) was collected from Highveld Mushrooms farm, in Gauteng, South Africa, where it was mixed with lime to increase its natural acidic pH to 7. Freshly mined peat from Potchefstroom was also collected directly from the mining area and was mixed with lime on the experimental farm at the University of Pretoria. Coir is a by-product of the coconut industry and was obtained from Galuku Africa, Sri Lanka, in 30 cm3 x 30 cm3 x 15 cm3 compressed bricks. The coir bricks were hydrated in 20 L of water for 24 h. Wattle bark (a fine-textured, dust-like material) is a by-product of charcoal and red tannins produced from black wattle trees (Acacia mearnsii) and was obtained from Paulpietersburg, South Africa. Bagasse and filter cake are waste products of the sugar industry and were collected from Sezela Sugar Mill in KwaZulu-Natal, South Africa. The bagasse and filter cake were leached out for two years before being used in the experiment, in order to remove substances toxic to the mycelium. We compared casing preparations of 100% peat with those of peat combined with various industrial by-products. Peat was combined with coir and wattle bark at a ratio of 1:1 and 7:3 (70% peat and 30% coir or wattle bark), and with bagasse and filter cake at 1:1 ratios. Each casing was replicated in three baskets, each containing 10 kg Phase III (Highveld Mushrooms farm, Gauteng, South Africa) compost (spawn run compost that is colonised and ready for casing). The baskets were randomly placed in a mushroom growing unit maintained at the University of Pretoria. Mushroom growing conditions had previously been optimised (22 ºC - 24 ºC temperature and 90% - 95% relative humidity; unpublished data). For the 100% peat preparation, both pasteurised and unpasteurised casings were used. For the peat-based mixtures, except for the wattle bark mixture, pasteurised casings were used. Pasteurised wattle bark is susceptible to contamination by cinnamon brown mould (Chromelosporium fulvum; unpublished data) and was therefore not pasteurised. Of the three replicate baskets, two baskets were sampled (100 g) for DNA extraction. Samples were taken directly after casing, at pinning (10 days), and at harvesting of second break (21 days). The entire experiment was then repeated. DNA was extracted from duplicate samples of casing materials using a Soil Master Extraction Kit (Epicentre Biotechnologies, Madison, WI, United States), according to the manufacturer's instructions, with the following volume modifications: 100 mg of casing material sample was placed in a 2-mL screw-cap microcentrifuge tube (Whitehead Scientific, Cape Town, South Africa) with two 0.25-inch ceramic beads; 375 µL of soil DNA extraction buffer was added to increase the DNA yield; tissue was disrupted using FastPrep FP 120 (Bio 101, Thermo Electron Corporation, Milford, USA) at 5 m/s for 20 s; and 75 µL soil lysis buffer was added. DNA was eluted from the filter using 100 µL TE buffer. Enzymatic amplification of the 16S rDNA region was performed using the primers Prun518r 5'ATT-ACC-GCG-GCT-GCT-GG3' and PA8f-GC 5'CGC-CCG-CCG-CGC-GCG-GCG-GGC-GGG-GCG-GGG-GCA-CGG-GGG-GAG-AGT-TTG-ATC-CTG-GCT-CAG3', designed for DGGE by Øvereås et al.14 and Fjellbirkeland et al.,15 respectively. The reaction consisted of a total volume of 20 µL containing the following reagents: 10.8 µL double-sterilised distilled water, 2.5 µL PCR buffer, 2 µL MgCl2 (10x), 2 µL dNTPs (2.5 µM), 1 µL of each primer (10 pM), 0.2 µL Taq DNA polymerase (5 U/µL) and 0.5 µL (±25 ng/µL) of sample DNA. PCR amplification was performed in an Eppendorf (Merck, Johannesburg, South Africa) thermal cycler starting with 10 min denaturation at 95 ºC, followed by 35 cycles of 30 s denaturation at 94 ºC, 30 s annealing at 58 ºC, 1 min extension at 72 ºC, and a final 10 min extension at 72 ºC. The amplicon was visualised on a 1% agarose gel, stained with 0.01% ethidium bromide in a Vilber Lourmat (Omni-Science CC, Randburg, South Africa) gel imaging system. The DGGE was performed using a D-Code (Bio-Rad, Johannesburg, South Africa) universal mutation detection system. PCR products in a 10 µL volume, each mixed with 3 µL loading dye, were loaded onto 40% - 55% denaturing gradient polyacrylamide (40%) gels. A control sample of Escherichiacoli was also loaded (data not shown). Electrophoresis was performed at 20 V for 10 min to allow gels to acclimatise and then at 70 V at a temperature of 60 ºC for 17 h. The gels were stained with 4 µL SYBR Gold nucleic acid gel stain (Whitehead Scientific, Johannesburg) for 1 h in the dark, then visualised and photographed under UV light in a Vilber Lourmat (Omni-Science CC, Randburg, South Africa) gel imaging system. Dominant bands from the resulting fingerprint pattern on the gel were excised under blue light on a Jiffy Lites Blue Light Box (Inqba Biotech, Pretoria, South Africa), using a sterile scalpel. The excised acrylamide gel fragments containing the bands were placed in sterile 1.5-mL microtubes, each containing 30 µL of sterile SABAX (Adcock Ingram Critical Care Pty Ltd, Johannesburg, South Africa) water, and stored at 4 ºC for at least 24 h. A 0.5-µL aliquot of the liquid was then used as a template for PCR using the previously mentioned primers. The DNA yield was verified by visualising the amplicon on 1% agarose gel as described previously. PCR products were purified using a PCR Purification Kit (250; QIAquick, Cape Town, South Africa) according to the manufacturer's instructions and sequenced at the University of Pretoria's sequencing unit. Gel analysis was performed using Gel2k gel analysis software,16 where similarity between samples was compared using a Jaccard group average setting. This analysis is based on band intensity in the lanes. A search, using the basic local alignment search tool (BLAST), was done for each sequence on the GenBank database and the matching hits, that is, those with the highest percentage identity and e-values closest to 0.0 indicating a statistically acceptable match, were selected for alignment. Resulting sequences were edited using Contig express (Vector NTI advance 11.0, Invitrogen 2008),18 aligned with Clustal X19 and inserted gaps were treated as missing data. Analysis for phylogenetic relationship was performed based on parsimony using the program Phylogenetic Analysis Using Parsimony (PAUP 4.0b8).20 Random addition of sequences (100 replicates), tree bisection-reconnection, branch-swapping, MULPAR-effective and MaxTrees were used to perform heuristic searches. Tree length distributions over 100 randomly generated trees were evaluated to assess phylogenetic signal in the data sets. The consistency and retention indices were determined for all data sets. Phylogenetic trees were rooted with Thermotoga maritima as the outgroup to the remaining taxa. In order to determine confidence in branching points (1000 replicates), bootstrap values were generated, retaining groups with greater than 70% consistency. The bacterial population density on the casing mixtures was very low during the casing stage for all samples. Therefore, sufficient amplification for samples at casing was achieved by doubling the amount of template DNA. 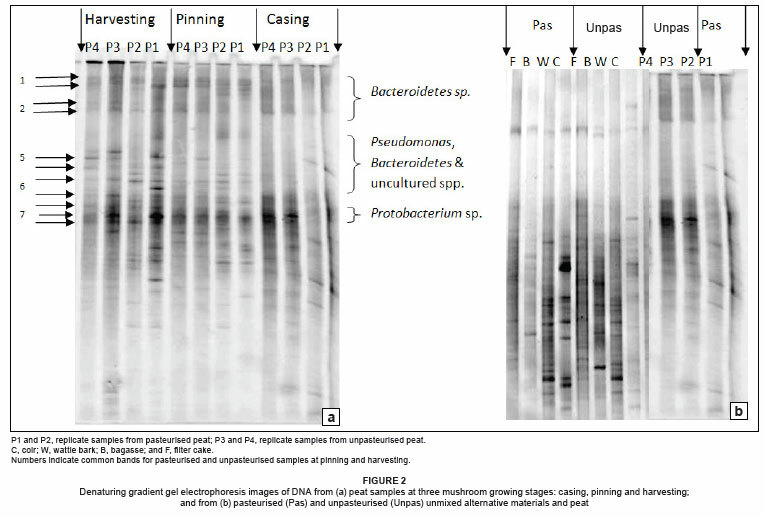 PCR products run on a DGGE gel showed higher bacterial population densities at the pinning and harvesting stages, indicated by higher band intensities in the gel (Figure 1). Lowering carbon dioxide levels by allowing fresh air into the growing room is a common practice that triggers or increases pinning of button mushrooms.3 Higher oxygen levels are favoured by aerobic bacteria and results in this study show that aerobic bacteria dominate the bacterial profile of the casing materials used. The similarity of band patterns (or band positions in the gel) signifies species similarities in all these peat-based casing mixtures, and the patterns are similar to that of peat alone, which is the common material in all tested casing mixtures. According to the band similarities, the bacteria that were prominent in peat-only casings also inhabited the casing materials prepared from peat-based mixtures supplemented with alternative industrial waste materials. Bacterial population density at the casing stage was higher in peat than in peat-based mixtures and the unmixed alternative materials. This result was evidenced by a lower quantity of DNA in the mixture samples, compared to the peat-only samples at casing. To obtain a PCR product that produced visible bands on the DGGE gel for the mixtures, the amount of template DNA had to be at least double that of the peat alone (optimisation experiments are not shown). However, at pinning there was a remarkable increase in bacterial population numbers in the mixtures in comparison with those in peat alone. Visual analysis of the gels showed a smaller increase in bacterial population sizes (from the time of casing to pinning) for the peat alone than that for the mixtures, indicating that the peat casings reflected stabilised bacterial populations. The alternative materials used in this study were effective in supporting the abundant growth of beneficial bacteria, which is important if specific bacteria selected from the profile data (with a well-identified beneficial role at pinning) are to be inoculated into casing material to enhance pinning formation. The pasteurisation of casing materials is practised by some growers for the purpose of eliminating disease-causing organisms. From this research, it is clear that pasteurisation did not eliminate the natural bacteria in the casing materials and allowed for a rapid re-establishment of these populations. Bacterial populations, as can be expected, were initially lower in the pasteurised peat samples than in the unpasteurised samples (Figure 2a). However, at pinning, there was no difference in the species richness and diversity between pasteurised and unpasteurised samples, which is evidenced by the common bands (1-11 in Figure 2a) in both the pasteurised and unpasteurised samples. 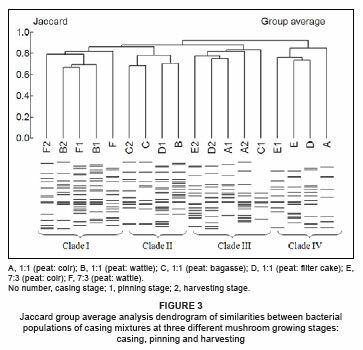 Jaccard group average analysis for casing mixtures resulted in the identification of four main clades (Figure 3). Most of the casing mixtures prepared from peat and wattle bark (B and F, respectively) were grouped within Clade 1. Casing mixtures prepared from peat and coir (A and E, respectively) were grouped under two neighbouring clades (III and IV) and casing mixtures prepared from bagasse and filter cake (C and D, respectively), were relatively scattered across Clades II, III and IV. Generally, the clades tended to form as a result of the origin of the samples and not in relation to the different mushroom growth stages. 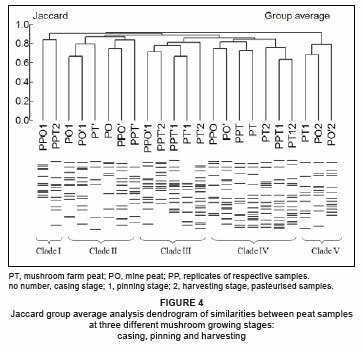 Jaccard group average analysis clustered pasteurised and unpasteurised samples of peat (from two sources) into five main clades (Figure 4). Peat samples tended not to cluster by their source. All five clades were composed of samples from both sources. The Jaccard group average diversity analysis of samples from casing mixtures showed a general tendency towards grouping samples based on their origin (i.e. the industrial by-product used in the mixture), though the grouping was not very distinct. The cluster analysis for peat samples, however, tended to group samples in relation to the mushroom growth stages. This established that the natural bacterial community structures in peat samples were not affected by pasteurisation or the peat sources used. Most peat samples at casing, irrespective of the source (from the farm or the mine), clustered together in two clades. This grouping reflected the difference in population sizes, rather than community structure, in the peat samples between the time of casing and subsequent growth stages. Sequencing of DNA from the DGGE gel bands indicated that the prevailing dominant species from pinning onwards were close relatives of Flavobacterium spp. and Pseudomonas spp. Other dominant species included close relatives of alpha-Proteobacterium, beta-Proteobacterium, gamma-Proteobacterium, delta-Proteobacterium and uncultured species. Phylogenetic analysis showed that the bacteria that were dominant from pinning onwards were taxonomically diverse. 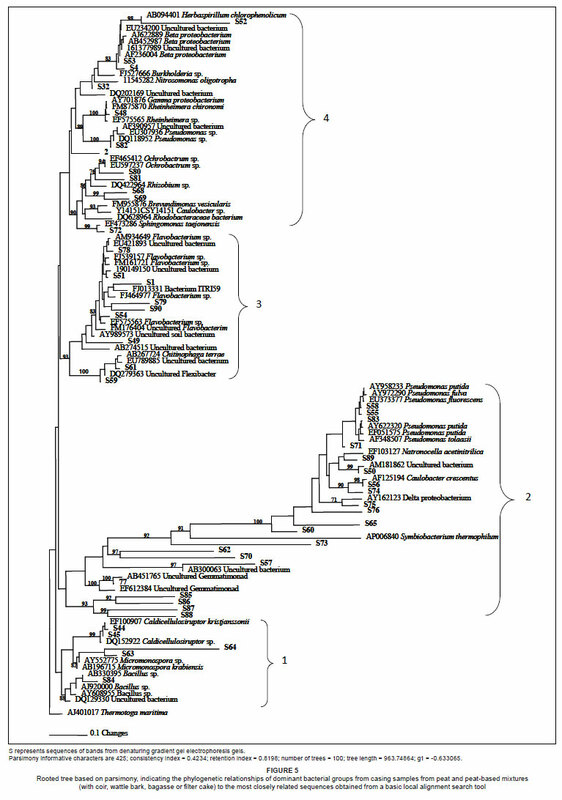 Sequences that originated from the brightest bands of samples from the time of pinning onwards are mainly in Groups 2 and 3 of the phylogenetic tree (Figure 5) and their closest relatives are Pseudomonas, Flavobacterium and uncultured species. Group 4 also represents sequences of bands that remained high in population size at pinning, with their closest relatives being from the Proteobacteria group, dominated by the alpha- and beta- groups. Sequences that originated from less bright bands of samples from pinning onwards, as well as bright bands of samples at casing, were grouped at the lowest part of the phylogenetic tree (Group 1). In conclusion, several species were identified in the bacterial profile of the peat casing materials and as potential bacterial communities possibly involved in the pinhead initiation process. Pasteurisation caused a reduction in bacterial population size in mushroom casing materials; however, by the time of pinning, bacterial populations had been re-established. Peat-based mixtures of the alternative materials, coir, wattle bark, bagasse and filter cake, produced a similar profile to that of peat alone. These materials are thus able to harbour high numbers of bacteria, and can be used successfully for casing mushrooms when mixed with peat. We acknowledge the South African Mushroom Farmers Association (SAMFA), National Research Foundation (NRF) and the Technology and Human Resources for Industry Programme (THRIP), a partnership programme funded by the Department of Trade and Industry and managed by the NRF, for funding this research work. We also would like to thank Dr L. Meyer, Ms R. Jacobs, Mr C. Wairuri, Ms C. Johnston and Ms S. Colignon for molecular advice and assistance, Ms A. Redmond for technical assistance, Ms A. van Heerden for editorial support and Highveld Mushrooms for providing research materials.